Technological advances in today's modern firearms, ammunition and optics have enhanced the potential for long range accuracy. However, precision mounting and alignment of your system's scope is critical to realizing that potential. A scope's reticle must be precisely aligned with the barrel to ensure holdover or turret adjustments for bullet drop produce true vertical compensation for point of impact. If the crosshairs are canted left or right both elevation and windage bullet impact error can occur. The Wheeler Engineering Professional Reticle Leveling System is a precision tool designed to allow a scope to be perfectly leveled on any firearm with ease. CNC machining, factory adjusted calibration set screws, anodized aluminum construction and protective molded case put this instrument in a class of its own. The system is comprised of two machined aluminum level housings calibrated to their integrated levels. The Barrel Clamp Level is attached to the guns barrel while the smaller Reference Level is placed on scope base, bottom half of a ring or other flat surface perpendicular to the vertical axis of the gun. The gun is then rotated until the Reference Level is aligned. The tuning adjustment knob on the Barrel Clamp Level is then turned until its level is centered to match the Reference Level. At this point the Barrel Clamp Level is calibrated to the guns axis. The Scope can be installed loosely and the Reference Level placed on top of the scopes turret cap. 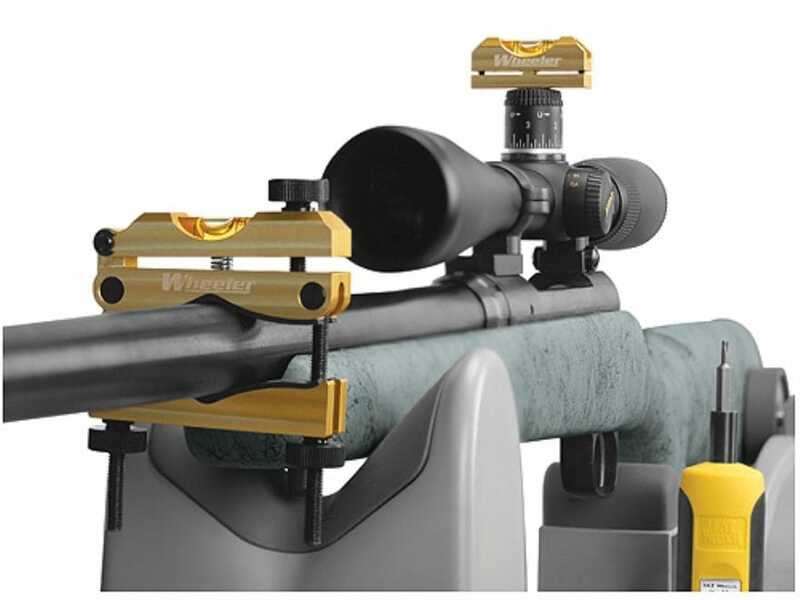 The scope is rotated until the Reference Level is aligned with the Barrel Clamp Level and then simply secured in place. The Wheeler Professional Reticle Leveling Sysytem is the most effective instrument available for precision scope alignment.